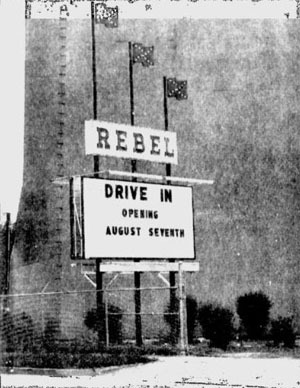 The Rebel Drive-in would open during 1964. For more on the drive-in and other fun things to do during the '60s, see Page 13. Each decade of the 20th century saw change after change come to Etowha County area. The 1950s began with a period of growth covering the area although this decade came to a close with a mild recession being felt in Etowah County. The closing of two mills in Gadsden brought the unemployment rate in the county to a post-World War II high. The 1960s would also see major changes come to Etowah County as well as the rest of the country. The 1960s would see the civil rights movement begin to move faster and faster. The 1960s would begin with blacks and whites not allowed to use the same public restrooms, water fountains or waiting rooms. This period also saw black movie goers required to sit in the balcony take seats at the rear of busses and they also were not allowed to eat at the same lunch counters. The 1960s would see the civil rights movement gain momentum with many of these inequalities being addressed by the decade's end. Great strides had been made to bring civil rights to everyone in the country. The 1960s would see many other changes come to Gadsden and Etowah County. The Princess Theatre would show its last movie on a November night in 1963. Shortly after closing, a spectacular fire would destroy this downtown Gadsden landmark. The 1960s also would see the old Gadsden City Hall demolished along with the old city jail. New Businesses also would come to the Etowah County area during the 1960s. The Agricola Shopping Center opened during this era bringing several stores and services into one convenient location. This was the built on the earlier site of the Elliott Car Works and the later Agricola Furnance Works. The Masons Department Store would open shortly thereafter near the banks of the Coosa River. The 1960s also would see the local drive-in restaurants come to age in Etowah County. Many of these places that specialized in hamburgers would be an overnight success and stay in business for many years. Most people who grew up in Gadsden in the 1960s still remember the taste of a Paul Bunyan Burger or the drive-in speakers where you would order from your car at the Magic Burger in Attalla. The 1960s would see the Rebel Drive-In Theatre open at the site of the Grove Drive-In in Alabama City, Lake Rhea would gradually add attractions and grow into one of Etowah County's largest amusement attractions. This decade also would see a new United States Post Office built in downtown Gadsden. A new Public Library also would open on College Street behind the Post Office. Noccalula Falls also would grow into a major tourist attraction during the 1960s. Picnic areas and pavilions were added along the Noccalula Nik-Nak, a great place to buy sandwiches and ice cream. Noccalula Falls Park would become the premiere tourist attraction in this area during the 1960s. The 1960s would see many changes coming on the national and worl scene. The rock-and-roll craze had become full blown with the Beatles and other groups taking the United States by storm. Music would never be the same again. A three-day concert which took place in an area of New York called Woodstock would leave the country and the world shaking its head and wondering what the times were coming to. Another earth-shattering event that took place during this decade was man's attempt to land on the moon. This decade-long project would be fulfilled during the Summer of 1969 when the Eagle landed on the moon with Neil Armstrong becoming the first man to set foot there. Buzz Aldrin would join Neil Armstrong a short time later as being the first to set foot on lunar soil. Before the end of the decade, the United States would accomplish this feat again and again. Etowah County would witnessmany changes during the 1960s. Although this decade began with the area facing a mild recession, many good changes would come to the county. The 1960s would see many changes come to Gadsden and Etowah County. The Princess theatre would show its last movie on a November night in 1963. Shortly after cosing, a spectacular fire would destroy this downtown Gadsden landmark. The 1960s also would see the old Gadsden City Hall demolished along with the old city jail. The original Pic-A-Burger was located on the corner of Twelfth Street and Alabama Avenue. For more on the rise of hamburger stands in Etowah County, see Page 9. Articles for this section were prepared by Mike Goodson. Photographs, unless oherwise noted, were provided by Bob Scarboro. They are the authors of "Images of America: Etowah County." The pictorial history book sells for $16.99 and is available at the Gadsden/Etowah Tourism Board, the Gadsden Area Chamber of Commerce, Downtown Gadsden, Inc., Alaco Pharmacy on Noccalula Road, the Herb Shop of Attalliam, Bookland at Colonial Mall Gadsden, Scarboro Photo Shop, the Book Store at 543 Broad St., Gadsden, and Barnes and Noble in Birmingham. Copyright © 1999 The Gadsden Times. All rights reserved.